This is the first in a series of Do It Yourself efforts trending Around Los Angeles. Some are purely hobbies that have taken off in unexpected ways, but most are projects and places built around a combination of necessity, ingenuity and frugality that often give people new skills and new approaches to various parts of their life. Emily Salzfass has fond memories of riding a bicycle as a child. 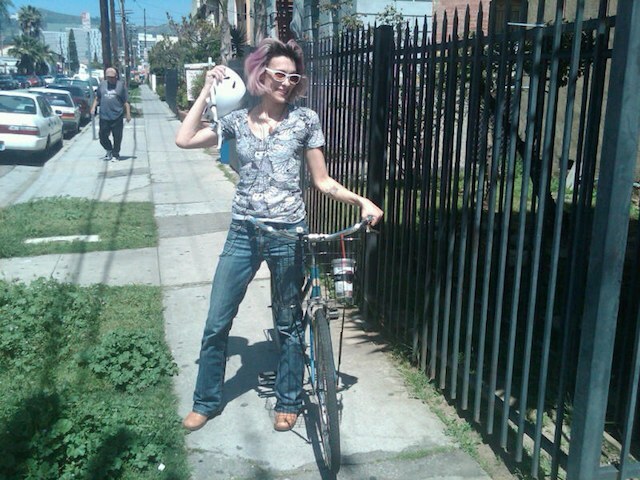 In fact, she considers herself a biking kind of girl. But until a few months ago, she’d never owned a bike as an adult: “I liked the idea of biking, but I had a car to maintain and deal with,” she said. “I didn’t want to add on the additional expense of a bike.” Several cars, several parking tickets and a massive recession/gas price hike later, and Emily is living a car-free existence while riding a bike that she built herself with help from the volunteer “cooks” at the Bicycle Kitchen. From not owning a bike to installing new gears in only a few short months is quite a leap in knowledge and skill. Emily credits the cooks at Bicycle Kitchen for their help and encouragement. They helped her swap out her seat, fix her handbrake and add a basket to the front. And she’s not the only one. Similar co-ops are popping up throughout Los Angeles, offering new fans and long-time bike enthusiasts a place to bring their bicycles to upgrade them, learn to change tires, or get assistance building something from scratch. For a $7-$10 donation, these shops help you help yourself. Most volunteers start out as customers. The experience of putting wrench to gear turned them into something else: part of a collective community of mechanics and teachers, largely self-taught and eager to pass on that knowledge. John Brown is one of those helpful folks. A volunteer at Bikerowave in Mar Vista, he returned to cycling in 2008 after the rise in gas prices. He hauled out his old mountain bike and set himself the task of getting it ready to go. He enjoyed the process so much, that he filled out an application to be a volunteer. John, and others, largely figured out how to do his own biking work through sheldonbrown.com and the Park Tools website. But not everyone is as comfortable going for broke with a how-to book and a prayer. That’s where the co-ops come in. These non-profits generally have a board of directors and are staffed exclusively by volunteers. They are a “for the community by the community” sorts of places, which fits with the idea of biking as a combo of do-it-yourself transport and life-style. It doesn’t seem to be a stretch to consider a biking life the epitome of the DIY trend. The machine is a self-powered engine that gets you where you want to go requiring only your body, your sheer will and a certain amount of fearlessness here in Los Angeles. You can build one from scratch, fix one that’s broken, paint one that’s rusted and ride one that you bought or made all while feeling like you had a direct hand in choices that seem bigger than just moving from place to place. The investment of time and energy in space for wrenching a bike is different than an engine - it feels...manageable, practical, a hobby and a skill instead of a consuming project. Riding says something about your attitudes, your interests, and even your sense of style. A bike can call out your commitment to the environment, or simply your commitment to the joy of two wheels. It can even act as a rolling art project. Fortunately for all these riders, the City of Los Angeles is making strides towards giving bikers a break, and encouraging their acceptance in this car-mad city. April 17th CicLAvia event closed over 7 miles of streets to cars and opened them up to bikes and pedestrians. Emily Salzfass was there on her modified bike, enjoying the beautiful day while advocating for pedaling and the freedom she’s found in putting her hands to the wheel. In true co-op fashion, Bicycle Kitchen&apos;s website provides links to other co-ops around the city and in Southern California. Look for one in your area to start repairing or rebuilding your bike or simply to learn something useful and new.